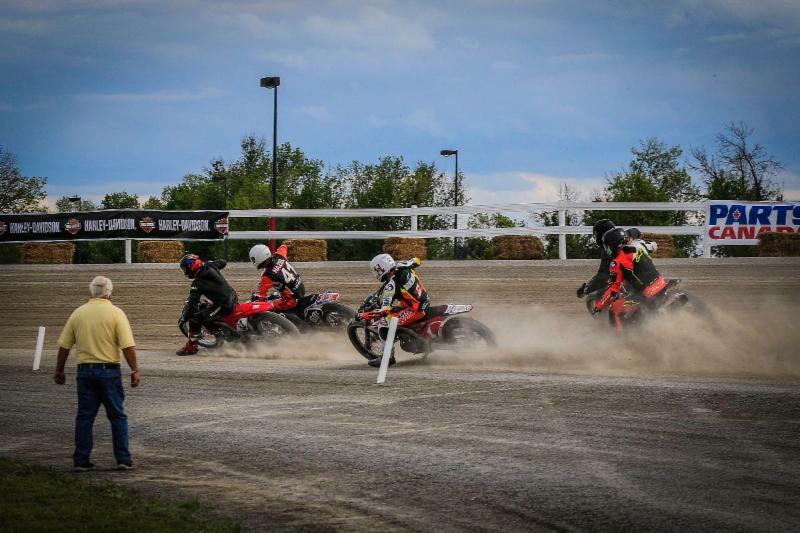 Round five of the Harley Davidson Canada flat track series presented by Parts Canada took place this past weekend at Flamboro Downs and fans were treated to an amazing show. In a night with a fair share of re-starts, there was plenty of drama on the track under the full moon hanging in the sky over turn two. Expert DTX turned into a battle of two former champions who had finished first and second in their heat race earlier on in the program. 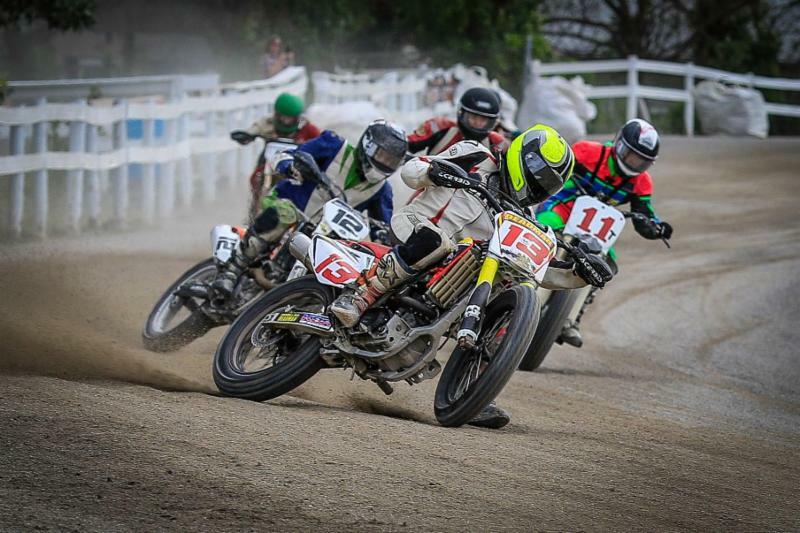 As the lights turned green off the start, Don Taylor on his KBR Honda led the pack into turn one with Dustin Brown in hot pursuit. After a bit of a shuffle in the pack between one and two, Tyler Seguin picked his way through the traffic to lead them down the back straight for the first time. With Seguin alone at the front, Brodie Buchan was making his way through the pack and closing in on the leader. Lap five saw Buchan finally get within striking distance of Seguin but it was lap seven where he tried his first big move. As Seguin headed into turn three, Buchan dove hard underneath him in an attempt to push Seguin high. Seguin and his Evans Racing Honda had other ideas however and held his line as the two riders came through three and four together. Buchan would wait until the final lap to try again but once again was unsuccessful. Criss-crossing in turn four, the two riders had a drag race to the line with the Buchan Racing Honda ending up less than a bike length behind Seguin at the line. 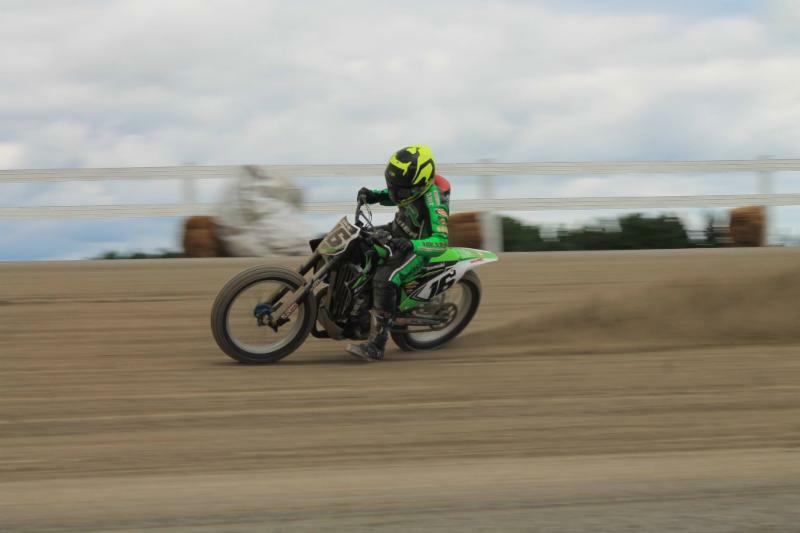 Rounding out the top three was Kawasaki mounted Dave Pouliot. Best race of the night was the Dash for Cash. With five of the top six Open Expert qualifiers taking part (Chris Evans decided to sit this one out); fans were in for a treat in the four lap shootout. Off the start Pouliot and Dominic Beaulac lead the charge into turn one as the other three fought for position behind them. While Pouliot and Beaulac battled out front, Buchan found himself unhappy back in the fifth position and was looking to move up. Feeling the pressure of a bad start, Buchan made a rare mistake in turn one and went down hard. Buchan was unable to make the re-start and early prognosis for the reigning champ is a broken arm. Beaulac nailed the re-start but was passed by an eager Pouliot in turn three of lap one. One lap later Pouliot lost the back end in the same place Buchan went down and went for a slide as the field did their best to avoid him. Uninjured, Pouliot lined up on row two for the re-start which once again saw Beaulac lead them into turn one. Going through three and four for the first time Pouliot made an outside move to take over second and just one lap later was challenging for the lead. On the final lap Beaulac pushed Pouliot way up to the top of the track in an effort to block him from the inside. Pouliot somehow got a great drive out of turn four on his JPR Rotax and took the victory at the line by a bike length in front of the cheering crowd. As Open Expert lined up for their race Pouliot looked like the man to beat. With a shake- up in points imminent due to the absence of Buchan, the first attempt at a start saw Beaulac flagged for a jump start for the second time this season sending him to the back of the pack. First attempt at a re-start saw Luke Rahm jump from row two which meant he would be joining Beaulac on the back row. Second re-start stayed green and the early leader was Sehl Racing rider Dustin Brown with Stephen Vanderkuur and Pouliot close by. Pouliot made quick work of the leader and by the end of lap one had taken over the lead position. Meanwhile Beaulac was charging from the back and had just passed Chris Evans for fourth. As the laps went by Evans had his bike expire in turn two while the top three riders opened a gap on the rest of the field. At the checkers it was Pouliot with a dominating win followed by Brown and Vanderkuur. The victory was Pouliot’s third in five races and the message has been sent that he is the man to beat on the cushion tracks. 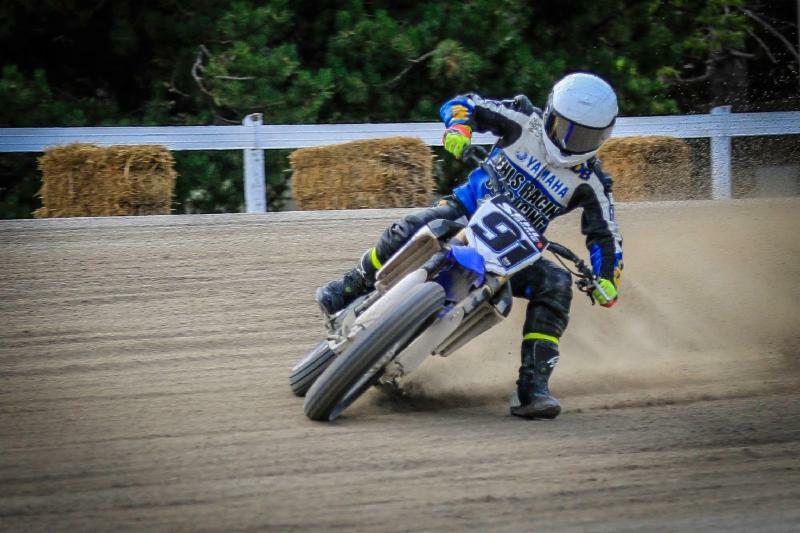 Once again the Intermediate class belonged to Hunter Bauer as he checked out on the field in both races with Jarrett Phibbs and Jimmy McCullough rounding out the top three. 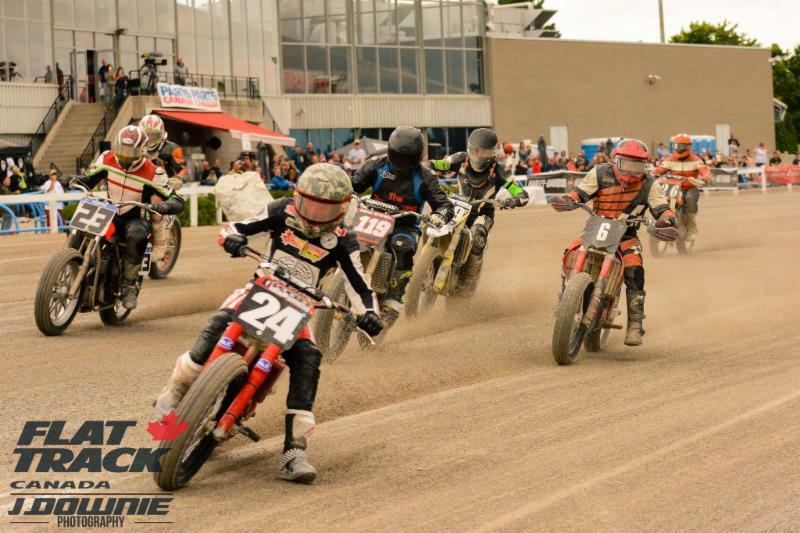 Novice action saw speedster Taia Little take the DTX victory while Quebec native Felix Dandurand took the win in Open. If you missed the races, you can still watch the live stream. Check it out Here. 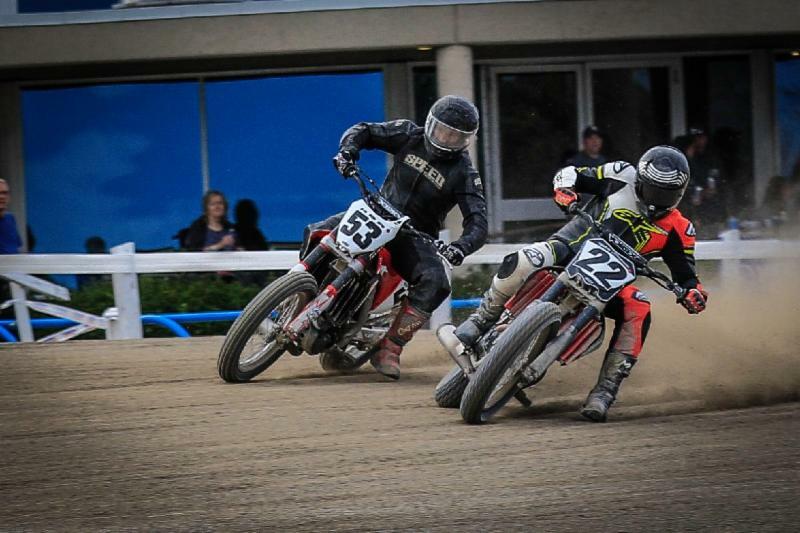 Next action will be this coming weekend as Oshweken Speedway plays host to rounds six and seven. 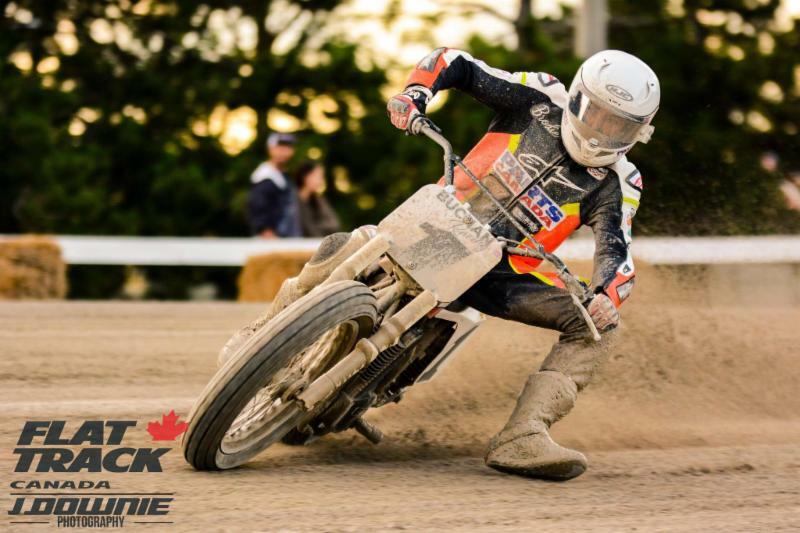 More information can be found at www.flattrackcanada.com To purchase tickets in advance and save some time, you can purchase them here. For the current point standings click here.